I'm a Buffalo, NY native, but I now reside in Columbus, OH. I love discovering new places around town. Here is an inside look at my favorite spots, events and activities in Columbus. This hidden gem is one of my favorite dinner spots in Columbus. If you didn't drive down a random alley called Highland St. (off of Neil Ave & Hubbard Ave.), you would never even know this place existed. It's literally a block from my house, and I didn't discover it until after about a year of living there. This place has the most unbelievable food. Everything we tried (and we tried quite a lot) was absolutely delicious. I would recommend sitting on the outdoor patio because the atmosphere is so quaint and romantic. They even cover it and put space heaters there in the winter, so it is available all year round. Located right on High St. in the heart of the Short North, this little boutique is one of the most fashionable stores in Columbus. They also carry brands that aren't available in the area unless you're ordering online - brands like Parker, Dolce Vita, Twelfth Street by Cynthia Vincent, Rory Beca, Gorjana, Susanna Monaco, Madison Marcus, and Gypsy '05 just to name a few. If you need a dress for a special occasion, this is your spot. The owner is a Columbus native too! They support other local businesses and organizations in Columbus - and you should probably follow them on Facebook for sale and event notifications, because they are usually worth attending! Best. Ice Cream. EVER. That's pretty much all I have to say for this place. I'm really not kidding either. You may argue that you can't ever really taste a difference between ice cream brands, but the difference with this place is that is it homemade, they use all organic and local ingredients, and their flavors are one of a kind. For example: Goat Cheese with Roasted Red Cherries, Grapefruit frozen yogurt, Pistachio and Honey, Wildberry Lavender, Reisling Poached Pear, Queen City Cayenne, and the list goes on... If you go into their store, you can try any as many as you want, and even better, almost all are available by the pint. Talk about heaven. I have just lately gotten really into bike riding. I even went ahead and signed up for this year's Pelotonia (100 mile ride). So now, I've been utilizing the many bike trails that Columbus has to offer and they are pretty awesome. The Olentangy trail winds along the Olentangy river, which has some pretty nice views. Antrim Park, the photo shown above, is located on the Olentangy trail, right next to 315 N. The lake is gorgeous and isn't something most people know about. You can bike along one side or actually walk/run around the whole lake (about 1 mile around). I love coming here, whether it is to run, walk, or bike. It really is one of the prettiest parks of Columbus. Tucked away in downtown Columbus on N. Grant Ave, right across from CCAD, the Hills market is yet another hidden gem of Columbus. It is a small specialty grocery store, full of products almost all locally owned, grown, baked, picked, created, you name it. They carry baked goods from over 15 of the best local bakeries for example. And their dairy section is even better - my favorite item in the store is the locally homemade, organic cheese curds. They also have an unbelievable selection of pre-made meals, burgers, pizzas, sushi, etc. Last but not least is their Monday deal: if you buy one of their reusable grocery bags and use it on Mondays, you get 20% off your whole grocery purchase! I know I keep calling these places hidden gems, but I swear, this is another one. It's in a back alley in the Short North/Italian Village, right near the Homage store. This is by far my favorite breakfast spot in Columbus, but as hidden is it is, it's a popular spot. It is one room and seating is first come first serve, although you can almost always find a spot surprisingly. Take out is always an option though (and usually my option at least every other weekend). Tasi is a bit pricey, but it is definitely well worth the money. 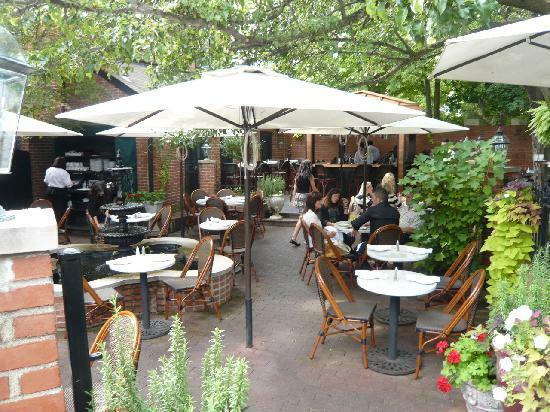 Lindey's has one of the best outdoor patios in Columbus. It's private, always busy, very pretty and well decorated, and the atmosphere is great. Lindey's is on the higher end price-wise, but I've never had a bad meal there. If you're looking for a delicious meal, wonderful atmosphere, happening place, then Lindey's is the restaurant to visit. There's not much to say about the North Market, other than the fact that is the most unique, fun, diverse grocery store you will ever visit. All the shops inside are different local vendors with products ranging from spices, to green goods, to juices, to pre-made meals, to home goods. They also offer events such as a farmer's market, artisan Sundays, cooking classes and more.